The first article of Italian Constitution states “Italy is a Democratic Republic based on labor”, but as Galli and Padovano argue at the beginning of their paper “Sustainability and Determinants of Italian Public Deficits before and after Maastricht”, a more accurate description should be: “Italy is a Democratic Republic based on public debt” (MIT, 2008). The horrendous show of the last political election made even clearer that point, and showed that everything can be pledged: the difference between real and fake policy seems no longer to be important in 2018. 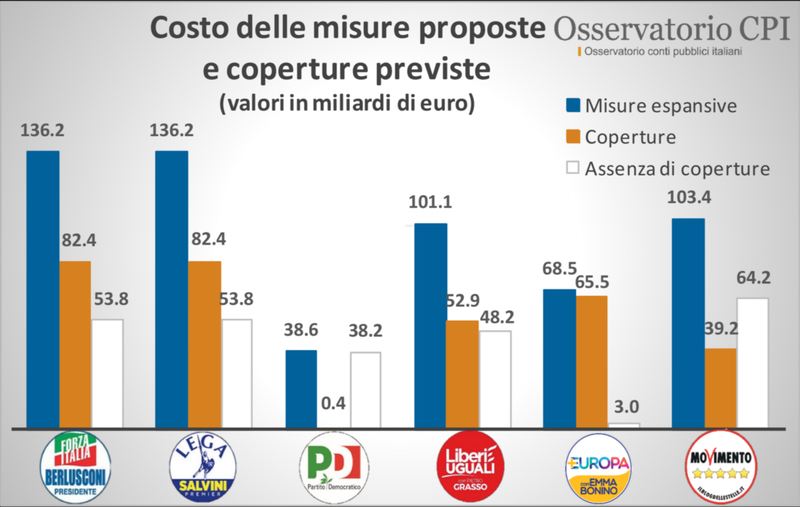 A couple of weeks before 4th March (the election day), Osservatorio CPI, the “public accounts observer” agency directed by Carlo Cottarelli (former commissioner for the spending review), stated that all major parties failed to cover expenditures in their political programmes, and that the future percentage of the Debt-to-GDP ratio was in every case far beyond their expectation. Fun fact: the two parties showing the highest potential ratios were the more critical ones about the debt situation and resulted the winners. Movimento5Stelle, the populist party lead by the comedian Beppe Grillo, ran for the election saying that, in order to solve the unemployment problem, Italy needed a form of basic income without a time limit; on the other hand Lega, the anti-immigrants party in coalition with the former prime minister Silvio Berlusconi, ran proposing a 15% flat tax, with a no tax area for incomes lower than 15.000€ per year. Both parties were against a large coalition between different parties, took eurosceptic positions, and proposed the abolition of Fornero’s pension law. Nobody of them ever clearly explained how they wanted to finance such reforms, or how the digits were born (why 15% and not 14% or 16%?) but now they are approaching the government. The election broke Italy in two parts: the vast majority of northern regions — the one with the higher incomes — voted for Lega and the southern ones — with the highest unemployment rate- gave a solid vote for M5S. Italy is inside the EMU and everyone knows that the country has strict rules about the possible budget deficit. 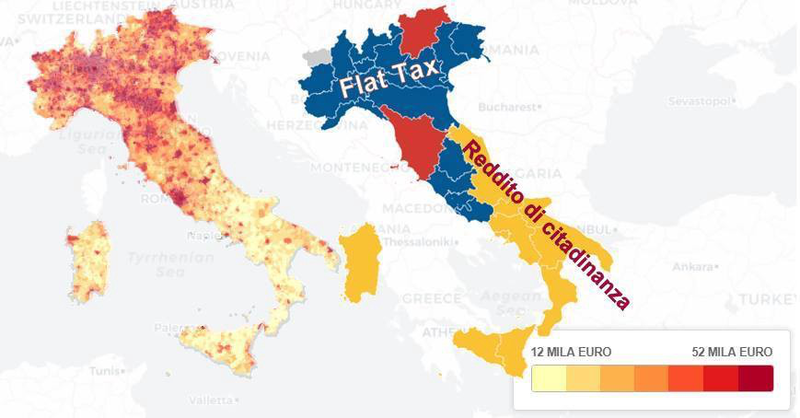 For example, Italy is now obliged by the treaties to find more than 30 billions Euro before the budget law that needs to be approved by the end of April: 12,4B for escaping the automatic increase of VAT, 12B for the gradual lowering of the deficit corrected for the cycle (the EU aim is to reach zero deficit in 2019) and 6B for the public administration contracts. This amount needs to be found by lowering the government expenses or by finding a way to have a higher sum of positive cash flows. Until the day of election, M5S and Lega held up saying that an agreement between the two parties was impossible and unacceptable, but when both started to feel power in their hands everything changed:not only in the last couple of weeks an agreement became possible, but important steps were taken towards the merging of the different proposals. 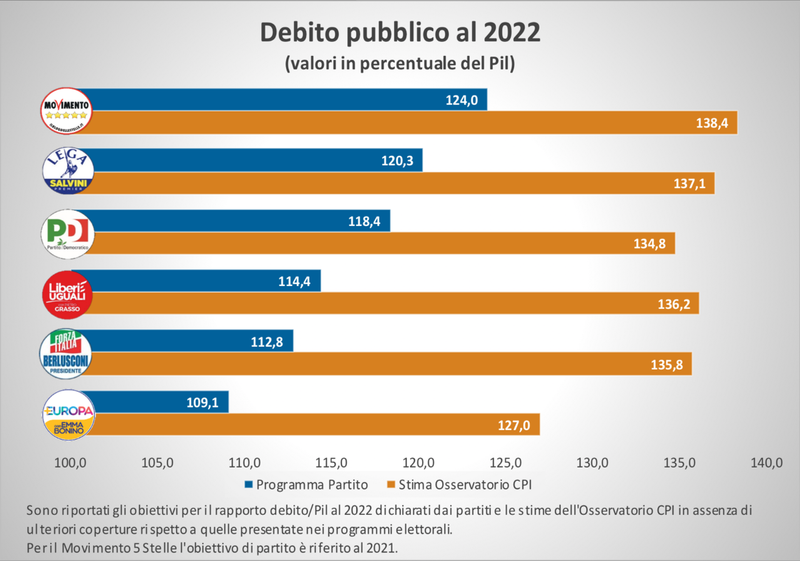 The future populist coalition is only planning to find the 12,4B covering for the VAT and, without caring about the budget deficit, intend to lower the taxation (without reaching the flat tax), to find a way to have a basic income (with a time limit) and at the same time to reduce the retirement age. What does it mean for the economy? Every time a country has to finance the welfare, the cover needs to be found in positive flows — taxation — or by debt financing. At the same time, lowering taxation implies a reduction of the government expenses — public sector -, a reduction in welfare — government transfers — or higher deficit burdening public debt. 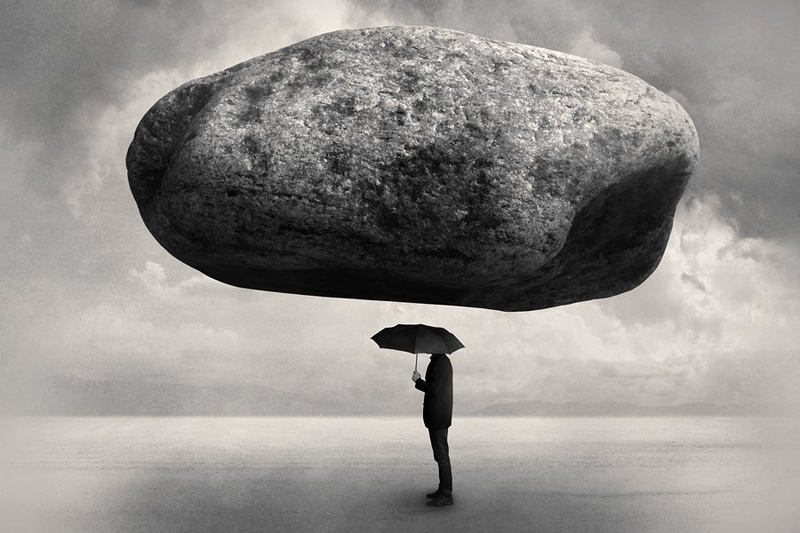 If taken together, a tax cut and more welfare can only lead to the millstone. Another point in common between M5S and Lega seems to be the connection with the Russian government, which appeared to be pushing them to succeed through the help of fake news bots, as previously happened during the United States Presidential Election. Not only they are against sanctions to Russia, but Lega is following the Trump way, implying that Italy should exit the EU in order to impose tariffs to the other member countries. This shows a complete disconnection from reality: Russia only counts for 1,6% of Italian exports (and the +19,3% in 2017 does not seem much of a damage) but EU market covers more than 50% of the overall. This measure, if applied in a market based upon exports such the Italian one, can only blemish trade, being followed by huge tariffs on imports imposed by the EU. A protective policy would maybe save some jobs in those sectors giving the coalition political approval from such workers, but will also come at expenses on other ones, inflicting pain on the all-embracing economy. At the end, neither M5S or Lega is really facing the big economic problem of Italy: the low and descending growth and labor productivity are not discussed and no real measures are proposed to steer more private investments and innovation to face the coming decades. The sad truth is that Italy is no longer competitive in a globalised market and a protective policy is not an option in a world getting everyday more and more interconnected. The most important thing seems still to be accusing the previous government for all the long standing problems, without trying to understand why the path is descending. Economists say that government cannot run Ponzi games in the long run, but the “new” Italian politicians are not understanding that in this moment a wider deficit will not help Italy in any way possible. And if the situation will stand thanks to the ECB quantitative easing, that makes it easier for companies to get loans and for EU member countries to refinance debt, it will probably become unsustainable when the rates will finally become higher than zero.